A family, members of which have lived in Portugal, Holland, England, Mexico, Surinam, the West Indies, and the United States. They came, probably, from the city of Caceres in Spain. The first reference to any person bearing the name is in a list of heretics, posted according to custom in the cathedral in the city of Mexico, where the names of Antonio Dias (or Diaz) de Caceres and Catalina de Leon, his wife, occur as "Judaizers"; the latter doing penance at an auto da fé, celebrated on Feb. 24, 1590, in that city. Their daughter Doña Leonor de Caceres was denounced as a "Judaizer" by her aunt, Doña Mariana Nuñez de Carabajal (see Carabajal), before the tribunal of Mexico. Her testimony (see Cyrus Adler, in "Publications Am. Jew. Hist. Soc." iv. 45, 47, 63) gives these data: Antonio Dias de Caceres and Jorge de Almeida (Adler, ib. pp. 29-79) married on the same day, in the city of Parmco, Mexico, Catalina and Leonor de Carabajal, sisters of the deponent, and, after a visit to Spain, moved to the district of San Paolo in the city of Mexico. Antonio appears to have lived in another district, in a house which served as a gathering-place for fasting and prayer; and although they all attended mass, and otherwise observed the rites and ceremonies of the Roman Church, they practised their Jewish rites in private. This was soon discovered; the deponent, her mother, and brothers were arrested by order of the Inquisition; and Antonio Dias de Caceres, fearing a similar fate, went to China.There he lived three years, came back to Mexico, feigned at first estrangement from his wife, because she was a "Judaizing" penitent, and finally, seeming to yield to the entreaties of friends who sought to bring them together, became nominally reconciled to her and set about in earnest to obey the behests of the Mosaic law. Antonio observed caution, dreading the arm of the Holy Office, but persisted, together with his family, in keeping the Sabbath at home. Prayers were recited at home out of a Hebrew book, said to have been written in verse, and the Psalms, without the required Gloria Patri, were chanted by all. His daughter, the above-mentioned Leonor de Caceres, figured as a penitent at an auto da fé held in the city of Mexico, March 25, 1601. A facsimile of a document, dated Sept. 6, 1608, containing an account of her trial, is given in vol. iv. of "Publications Am. Jew. Hist. Soc." A victim of the Inquisition in Toledo in 1625; wife of Luis Baez. Martyr, who died at the stake in 1665, at Cordova. Daniel Levi de Barrios celebrates him in verse in the prologue to his allegorical comedy "Contra la Verdad no ay Fuerça. Panegirico a los tres biena venturados mártires Abraham Athias, Yahacob Rodriguez Caseres, y Raquel Nuñez Fernandez, que fueron quemados vivos en Cordova por santificar la unidad divina, en 16. de Tammuz, año de 5425 (1665)," Amsterdam (no date). One of the founders of the Portuguese community in Amsterdam, who flourished about 1600. 1. Writer of the seventeenth century; son of Daniel de Caceres of Amsterdam. He translated from Italian into Spanish the "Vision Deleytable y Summarico de Todas las Sciencias," a work written by Alfonso de la Torre and translated into Italian by Domenico Dolphino. The translation of Caceres, published at Amsterdam in 1663, and dedicated to D. Emanuel, prince of Portugal, consists of two parts, the first dealing with the various sciences, the second with moral philosophy. Of the first part, ch. i. treats of the "evil of things, and the confusion in the world"; the following six chapters treat of logic, rhetoric, arithmetic, geometry, music, and astrology, and the remaining chapters treat of metaphysics, pneumatics, and physics. Part ii. discusses ethics and politics. Wolf ("Bibl. Hebr." iii. Nos. 903, 1854h) makes this Francisco de Caceres the author also of "Dialogos Satiricos," published at Amsterdam in 1616. Kayserling ("Bibl. Esp.-Port.-Jud." 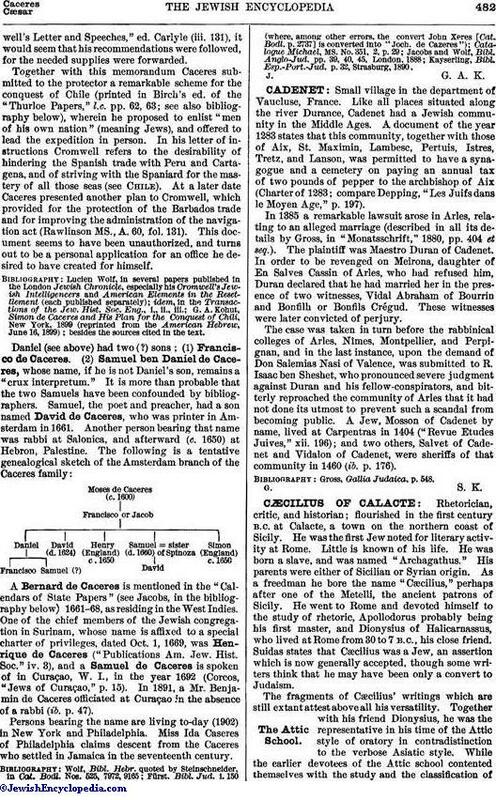 p. 32), however, ascribes that work to (2) Francisco or Jacob de Caceres who was probably a son of Moseh de Caceres, one of the founders of the Jewish-Portuguese community of Amsterdam. The latter Francisco or Jacob also translated into Spanish "Los Siete Dias de la Semana Sobre la Creacion del Mundo," a work by Bastasi, dedicated to Jacob Tirado. As the "Dialogos Satiricos" was published as early as 1616, it is not probable that the author was the former Francisco de Caceres. (1)Daniel de Caceres: Writer of the seventeenth century; son of Jacob de Caceres. He held the degree of master of arts.Caceres was a friend of Manasseh ben Israel, upon whose works, "The Conciliator" and "On Human Frailty" (written about 1642), he wrote approbations. He also wrote a eulogy on Saul Levi Morteira's (Amsterdam, 1645).D.A. R.
(2)David de Caceres, who, according to Kayserling, died Oct. 18, 1624, at Amsterdam (Kayserling, l.c. p. 32). (3)Henrique (or Henry) de Caceres, who lived in England c. 1650, probably the same who, with Benjamin de Caceres, petitioned the king (April 8, 1661) to permit them to live and trade in Barbados and Surinam ("Publications Am. Jew. Hist. Soc." 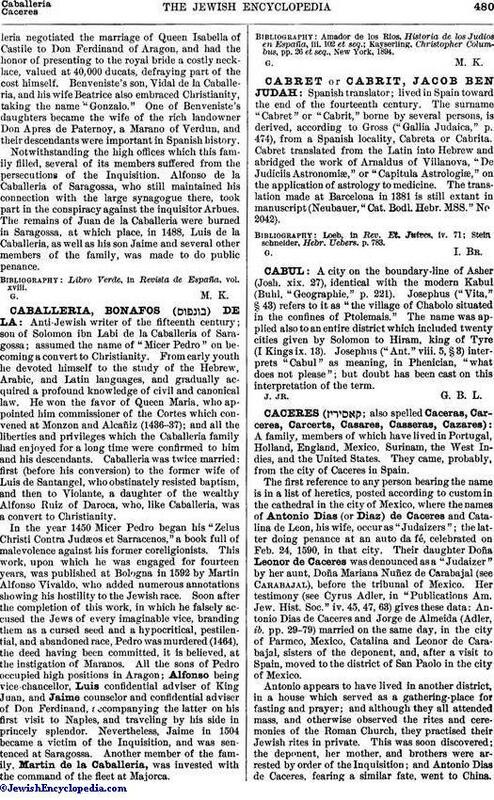 v. 47, 62; Jewish Encyclopedia, ii. 523b).J.G. A. K.
(4)Samuel de Caceres: Dutch poet and preacher; and brother-in-law of Benedict Spinoza; died Nov., 1660, at Amsterdam. He was a pupil of Rabbi Saul Levi Morteira of Amsterdam. 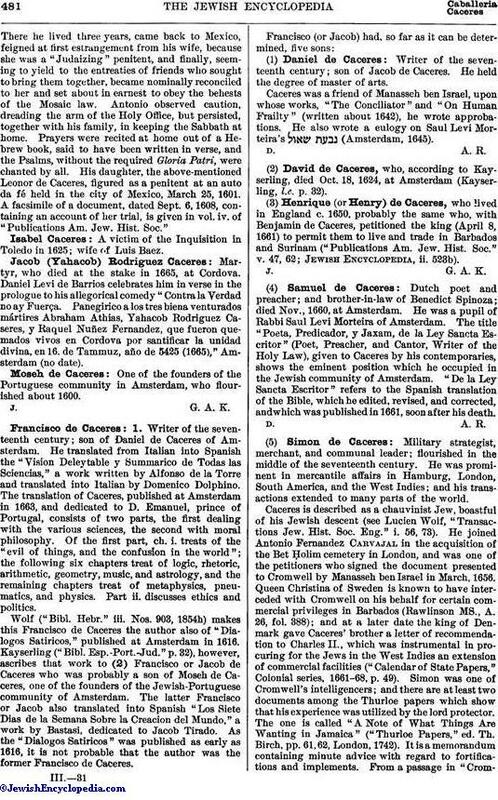 The title "Poeta, Predicador, y Jaxam, de la Ley Sancta Escritor" (Poet, Preacher, and Cantor, Writer of the Holy Law), given to Caceres by his contemporaries, shows the eminent position which he occupied in the Jewish community of Amsterdam. "De la Ley Sancta Escritor" refers to the Spanish translation of the Bible, which he edited, revised, and corrected, and which was published in 1661, soon after his death.D.A. R.
(5)Simon de Caceres: Military strategist, merchant, and communal leader; flourished in the middle of the seventeenth century. He was prominent in mercantile affairs in Hamburg, London, South America, and the West Indies; and his transactions extended to many parts of the world.Caceres is described as a chauvinist Jew, boastful of his Jewish descent (see Lucien Wolf, "Transactions Jew. Hist. Soc. Eng." i. 56, 73). He joined Antonio Fernandez Carvajal in the acquisition of the Bet Ḥolim cemetery in London, and was one of the petitioners who signed the document presented to Cromwell by Manasseh ben Israel in March, 1656. Queen Christina of Sweden is known to have interceded with Cromwell on his behalf for certain commercial privileges in Barbados (Rawlinson MS., A. 26, fol. 388); and at a later date the king of Denmark gave Caceres' brother a letter of recommendation to Charles II., which was instrumental in procuring for the Jews in the West Indies an extension of commercial facilities ("Calendar of State Papers," Colonial series, 1661-68, p. 49). Simon was one of Cromwell's intelligencers; and there are at least two documents among the Thurloe papers which show that his experience was utilized by the lord protector. The one is called "A Note of What Things Are Wanting in Jamaica" ("Thurloe Papers," ed. Th. Birch, pp. 61, 62, London, 1742). It is a memorandum containing minute advice with regard to fortifications and implements. From a passage in "Cromwell'sLetter and Speeches," ed. Carlyle (iii. 131), it would seem that his recommendations were followed, for the needed supplies were forwarded.Together with this memorandum Caceres submitted to the protector a remarkable scheme for the conquest of Chile (printed in Birch's ed. of the "Thurloe Papers," l.c. pp. 62, 63; see also bibliography below), wherein he proposed to enlist "men of his own nation" (meaning Jews), and offered to lead the expedition in person. In his letter of instructions Cromwell refers to the desirability of hindering the Spanish trade with Peru and Cartagena, and of striving with the Spaniard for the mastery of all those seas (see Chile). At a later date Caceres presented another plan to Cromwell, which provided for the protection of the Barbados trade and for improving the administration of the navigation act (Rawlinson MS., A. 60, fol. 131). This document seems to have been unauthorized, and turns out to be a personal application for an office he desired to have created for himself.Bibliography:Lucien Wolf, in several papers published in the London Jewish Chronicle, especially his Cromwell's Jewish Intelligencers and American Elements in the Resettlement (each published separately);idem, in the Transactions of the Jew. Hist. Soc. Eng., i., ii., iii.;G. A. Kohut, Simon de Caceres and His Plan for the Conquest of Chili, New York, 1899 (reprinted from the American Hebrew, June 16, 1899); besides the sources cited in the text. A Bernard de Caceres is mentioned in the "Calendars of State Papers" (see Jacobs, in the bibliography below) 1661-68, as residing in the West Indies. One of the chief members of the Jewish congregation in Surinam, whose name is affixed to a special charter of privileges, dated Oct. 1, 1669, was Henrique de Caceres ("Publications Am. Jew. Hist. Soc." iv. 3), and a Samuel de Caceres is spoken of in Curaçao, W. I., in the year 1692 (Corcos, "Jews of Curaçao," p. 15). In 1891, a Mr. Benjamin de Caceres officiated at Curaçao in the absence of a rabbi (ib. p. 47). Persons bearing the name are living to-day (1902) in New York and Philadelphia. Miss Ida Caseres of Philadelphia claims descent from the Caceres who settled in Jamaica in the seventeenth century. Kayserling, Bibl. Esp.-Port.-Jud. p. 32, Strasburg, 1890.